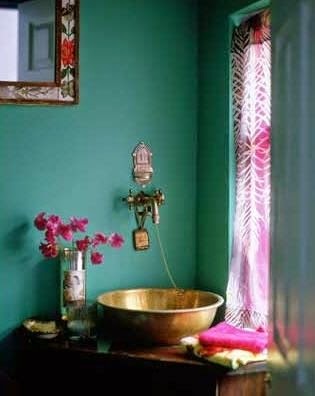 Teal can be a bold, quite dark colour to use all over but here it is beautifully contrasted by the pinks and the bronze sink pops out, almost glowing in the sunlight. Having just come back from Nepal, we saw bronze often used for sinks as well as heavy 'dhal blat' dishes on which you eat your simple supper from a hammered metal plate. The sink in the photo here reminds me of the warm colour and texture of the bronze we saw in Nepal- of course now I wish I had brought back the plates!